Jibo – a bot’s embodiment? The idea of bots is such popular due to the natural style of interaction. As it’s nice to be able to speak to a machine in a human-like manner (i.e., not through buttons and so on). And it’s also quite exciting to get the answer in a similar way (i.e., through speaking). For this reason we have Jabber bots, IRC bots, console bots (e.g., Emacs’ doctor), voice bots (e.g., Siri), and many more. Nevertheless, the concept of such bots is apparently incomplete as they can’t fully imitate the behavior of humans! In particular, the text messages just can’t express emotions (in a convenient way). To be able to do this bots would need bodies – e.g. eyes for users to look into, faces to express feelings, etc. Machines, that are able to interact with humans in a friendly manner, also exist – we call them robots. It can be said, that they are the same software bots, but with bodies. Certainly, robots are usually more advanced as they require more efforts to get implemented, but imagine, if a robot could also become a body for soft bot… Or if it could interact with soft bots to extend own capabilities (like humans, who operate machines to do some special job). In fact, this can be treated as integration of third-party applications. The great thing about this is that for a really smart artificial intelligence such intergration should not require writing any software adapter or whatever – ones will just need to introduce the soft bot to the “hard” bot and, possibly, shortly describe the commands, the former understands (i.e., no software development is to be involved at all). From this point of view the Jibo robot looks to be very promising. 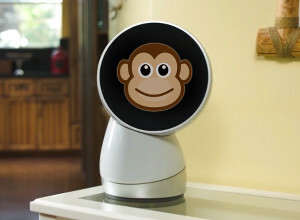 As it’s not just a gadget, that is able to recognize the predefined set of voice commands, but an artificial intelligence, that should be able to interact with systems, that have some minimal natural language interface (like Orangutan). As, in fact, it’s the same as speaking to a person with a very limited vocabulary, what Jiro seems would be able to do (I hope, it’s also would be able to use text messages internally). Jibo could serve as a sentinel. Thus, it could watch, who is entering the room, determine if it’s a known person, notify the owner, activate an alert and/or call the police in a case of intrusion. In a similar way it could also serve as a smart variant of radio-nanny, as a sick nurse, and so on. Jibo could also be your personal know-all – the one, who you ask about something unknown, when you face it. It could do the “dirty” job of “googling”, checking Wikipedia etc. Along with a head-monted display Jibo could be used to implement the telepresence (e.g., on conferences). In this case operators will be able not only to see and hear, but also to move the Jibo’s camera just by moving their heads. Jibo could also be a smart alarm clock, who you could ask to give you “15 minutes more” and who would be able to see, when you woke up (so would not wake your kid up accidentally), and so on. Jibo could also be your secretary when messanging. Thus, you can tell him, what to answer instead of typing the response on your own (e.g., when your hands are occupied). This capability could be used for many messaging systems including e-mail, Jabber, Twitter and Facebook. Jibo could look (periodically?) for certain types of information (e.g., news about iPhone, new fashion events etc) in news feeds and/or on some special web pages (this would require either lexical analysis of the HTML code or, better, intelligent analysis of the content) and let the user know as soon as it finds anything of interest. Using a special app the customer’s Jibo could become the first contact, the customer asks for assistance. Thus, Jibo (with the help of the app, of course) could first try finding the solution in the knowledge base and help the customer get rid of the issue on its own. Or, if failed, it could help collecting the required information about the issue and finding the appropriate real expert online through the help center. The support staff’s Jibo could play a role of mediator by reading the customer’s messages to a staff member and by typing his/her answers to the customer (e.g., if online chat is used). This should dramatically speed up the resolution process in theory (e.g., because no time would be spent for typing). The customer’s Jibo could also be used (on the customer’s approval, of course) to let the support staff “visit” the customer’s location to resolve the issue on-site (without the need for the staff member to move out of the office).